Sometimes, you just want pasta. Even though the traditional wheat based pastas are out on keto, that doesn’t mean you have to forgo the experience! 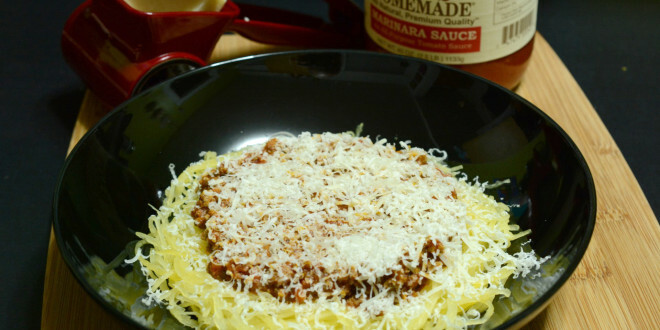 There are a lot of great alternatives popping up and I’ve got a whole section labelled Faux Pastas for you to explore! Today’s version uses a vegetable called the Spaghetti Squash to emulate pasta. Once cooked, the vegetable can be flaked, similar to pulled pork. 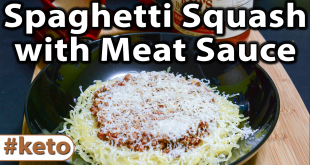 It ends up looking almost identical to Spaghetti and can be paired with all sorts of sauces! Today I’m going to show you how to prepare the vegetable and then make a meat sauce to go with it! Here’s the Spaghetti Squash. 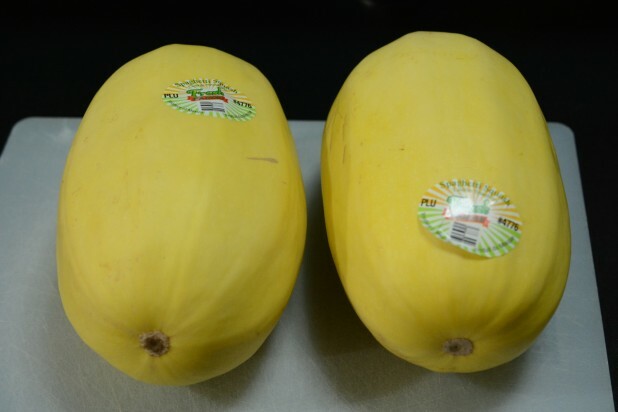 Note, this isn’t just a yellow squash, it is a very specific squash that will be labelled “Spaghetti Squash”. 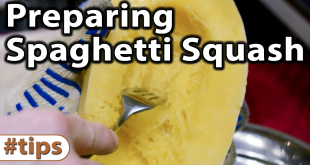 The first step is to cut the Spaghetti Squash open and ream out the interior. 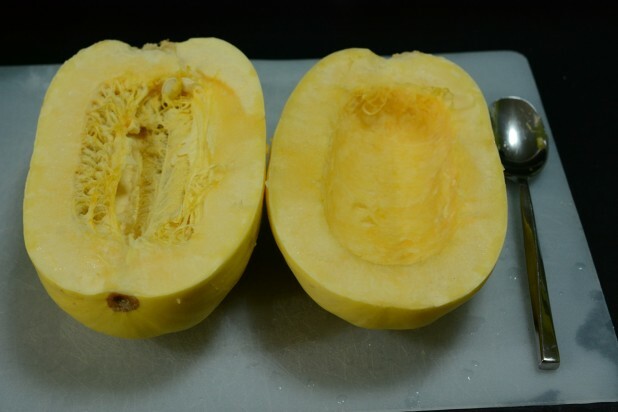 Be VERY CAREFUL when you cut open the Spaghetti Squash. 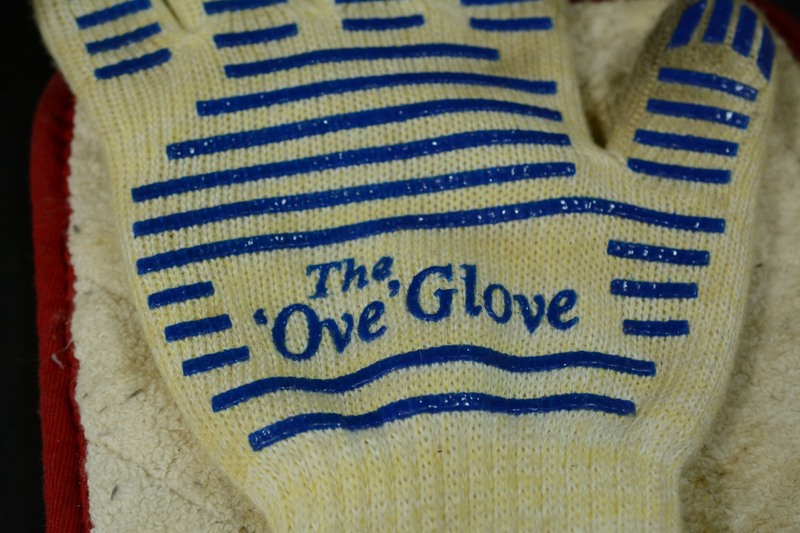 It has a very thick skin and you could easily cut yourself if you are not careful. I recommend stabbing it, then working your way around with a large knife. Once you have it open, it looks like a pumpkin. Just use a spoon to scrap out the insides. 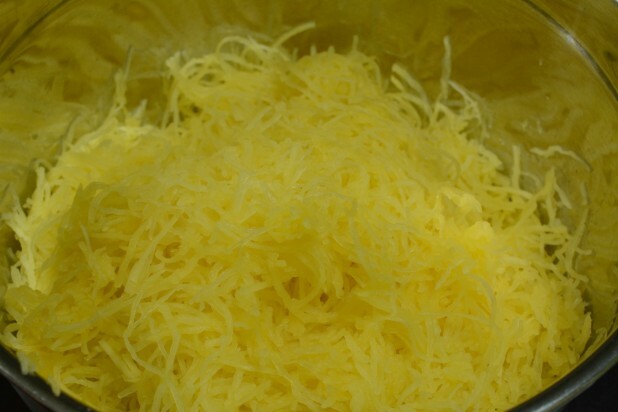 Next, lay the Spaghetti Squash face down in a large Pyrex dish. You want to cover it as shown a little bit higher than the cut line. 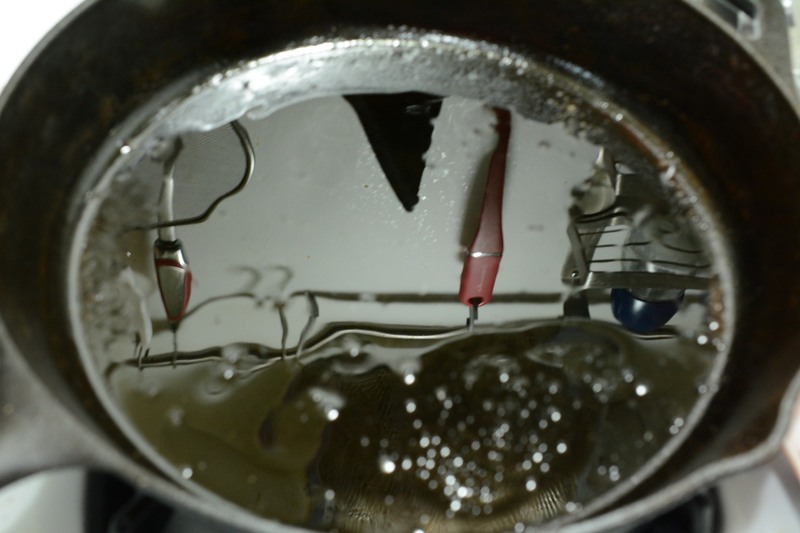 This way it steams the insides and gives it that Spaghetti structure we’re going for. Cook for 45 minutes at 375 degrees. 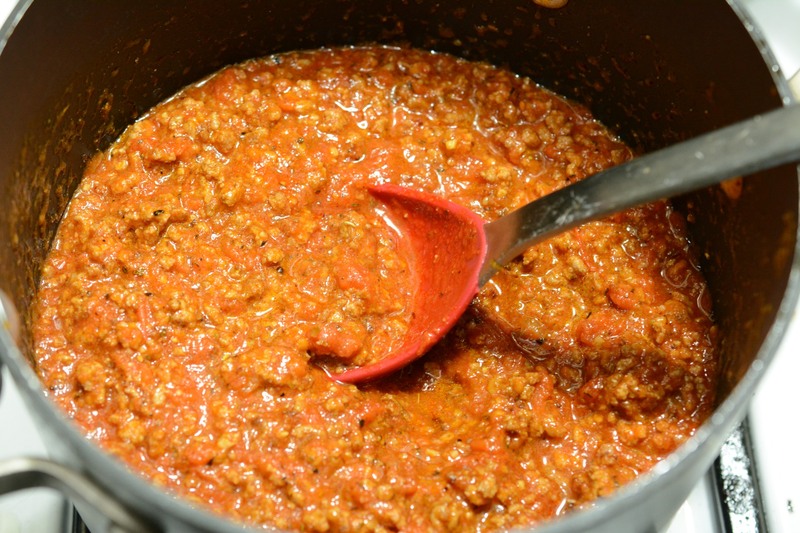 While the Spaghetti Squash is cooking, we can prepare our meat sauce. 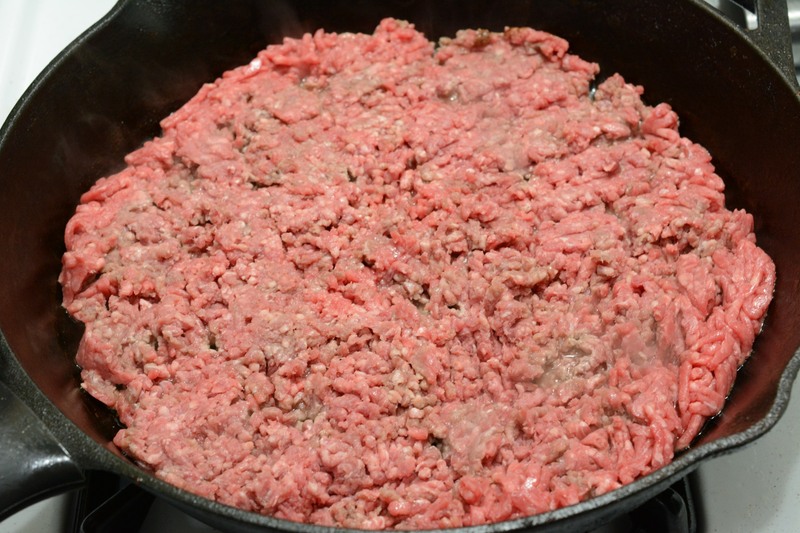 This part just starts with some ground beef. 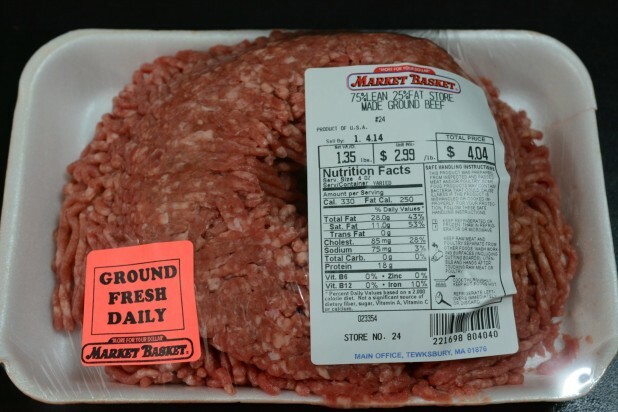 Remember that Keto is all about the fat so feel free to buy the cheap meat like this 75 / 25 meat! 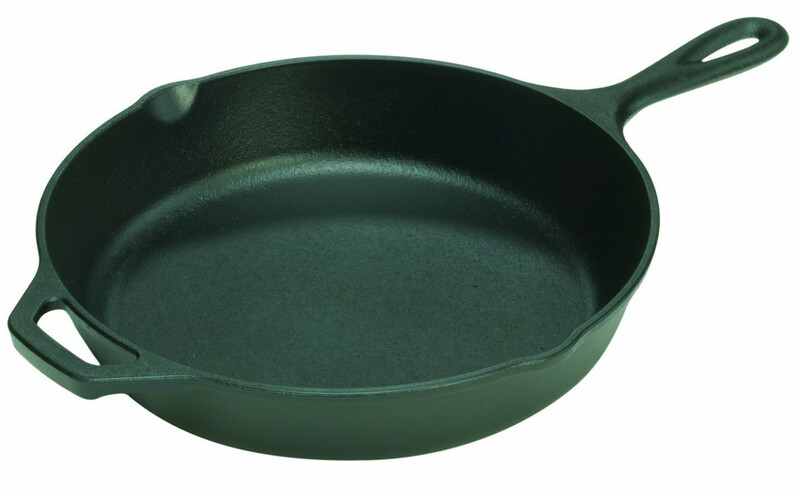 Add some oil to your cast iron skillet and get ready to brown some meat! Speaking of meat, I’ve never actually showed my method of cooking meat. 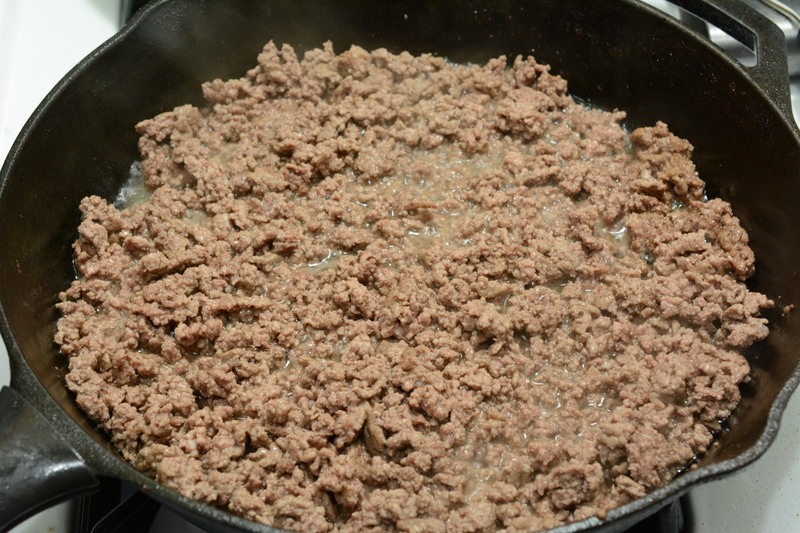 Basically I start by spreading it all out evenly and letting it cook for a few minutes. 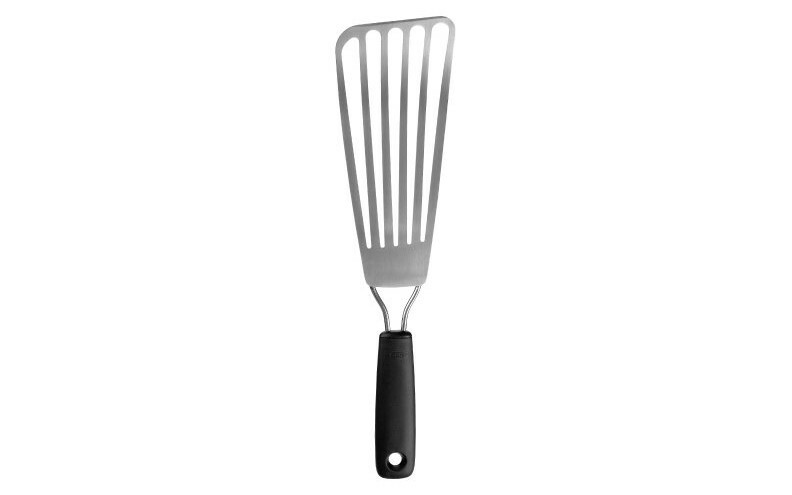 Then, once juices form and it appears to be browning on the bottom, I use my fish spatula to break the meat into four different sections. 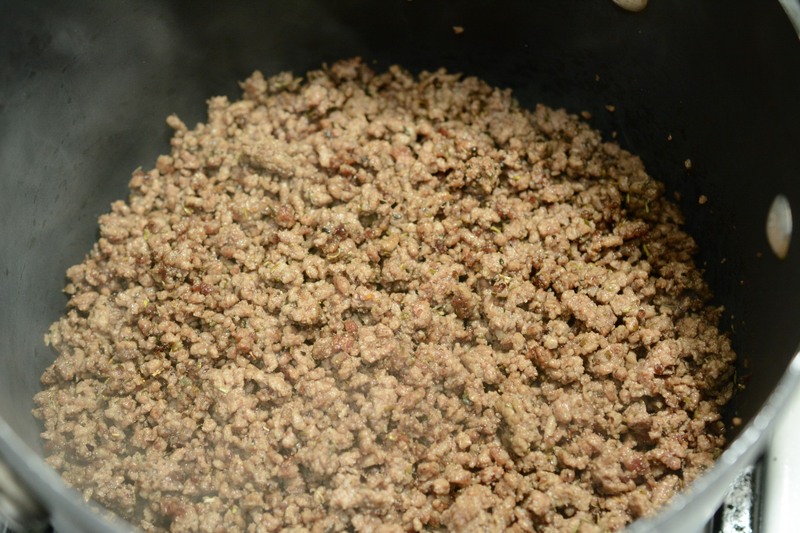 Then I flip the four sections as well as I can and let it cook some more. 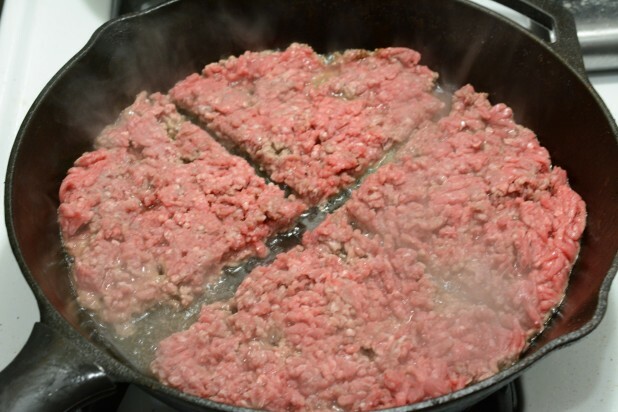 Once the bottom has had a chance to cook a little, I use the spatula to slice both horizontally and vertically across the meat to break it up. At this point most of the meat is no longer pink and its mostly cooked. Then finally I move it all around and it forms into small bits. I believe this to be a fairly efficient way to cook the beef while also not turning it into a large hamburger 🙂 Once its all cooked, add the italian seasoning and mix it around! Now to the sauce. 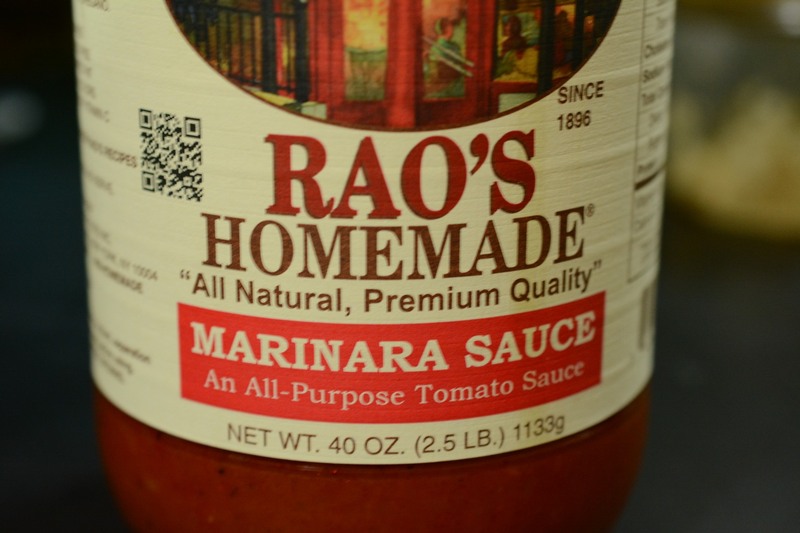 You have to be VERY CAREFUL in selecting a pasta sauce. Most have a ton of carbs. Rao’s Homemade line of sauces are all very low carb. Note this one is from BJs so I didn’t use the whole jar since this one is 40 Oz. As you can see its 3g net carbs per 1/2 cup which is the lowest I’ve ever seen. 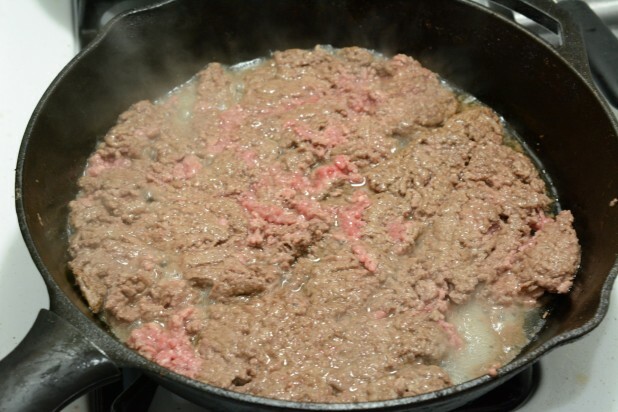 For the sauce, I transferred it to a sauce pan so I wouldn’t gum up the cast iron. 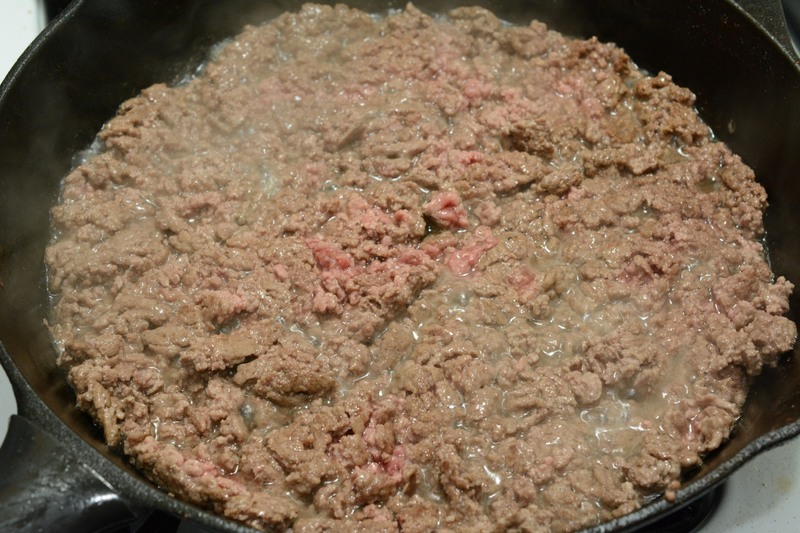 Then I added the sauce to the meat, added the garlic and heated it up! At this point you can taste it and add more spices if you want. 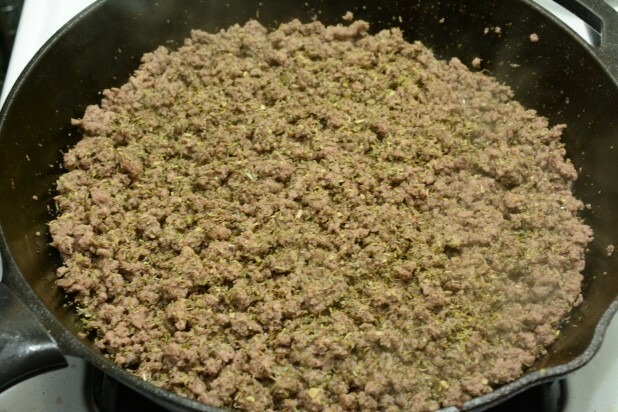 You could add some Oregano, Basil, Thyme, etc. At this point, the Spaghetti Squash should be done. Now, the Squash has been cooking for 45 minutes so it will be very hot. However, you don’t really want to let it cool before stripping it. 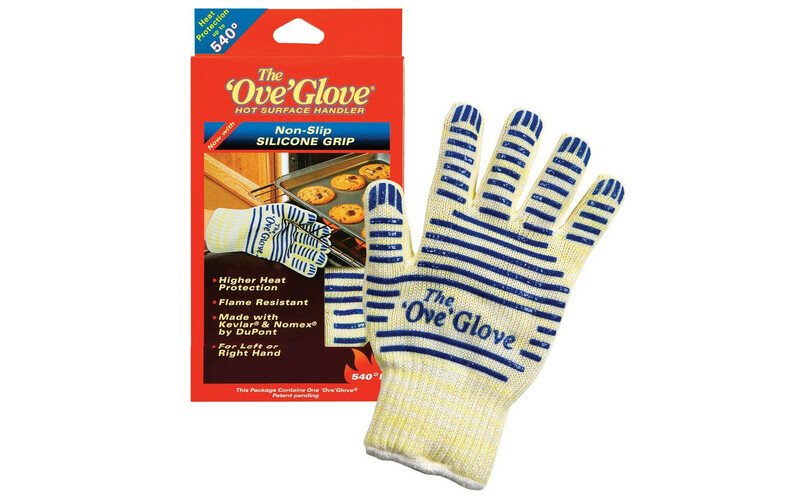 So, I recommend using something called the ‘Ove’ Glove which is basically an oven mitt in glove form. 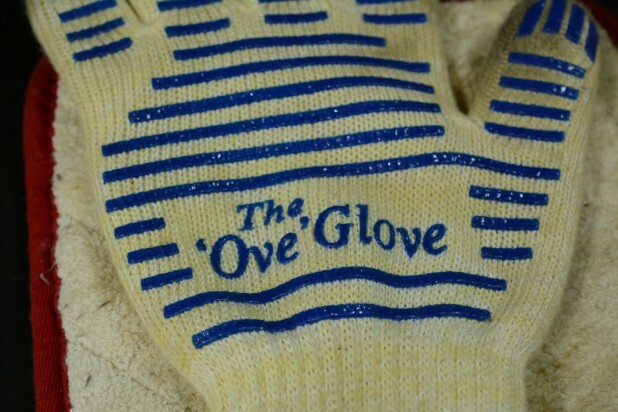 Grab the Spaghetti Squash half with the ‘Ove’ Glove and take a fork and scrap downward as shown in the picture. 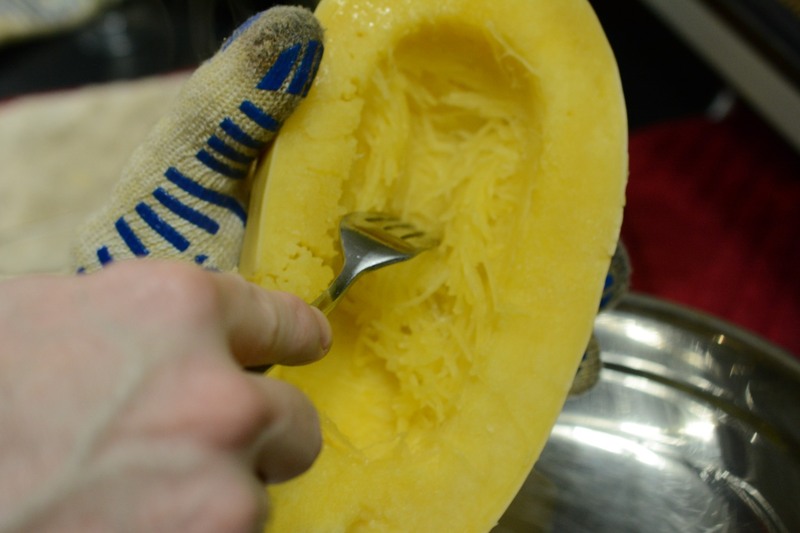 It might sound complex but as soon as you dip the fork in this thing it will become obvious why it is called a Spaghetti Squash. It is very easy to strip, don’t think this is complicated to do just because of all the pictures. At the end, you should end up with a ton of Spaghetti Squash. 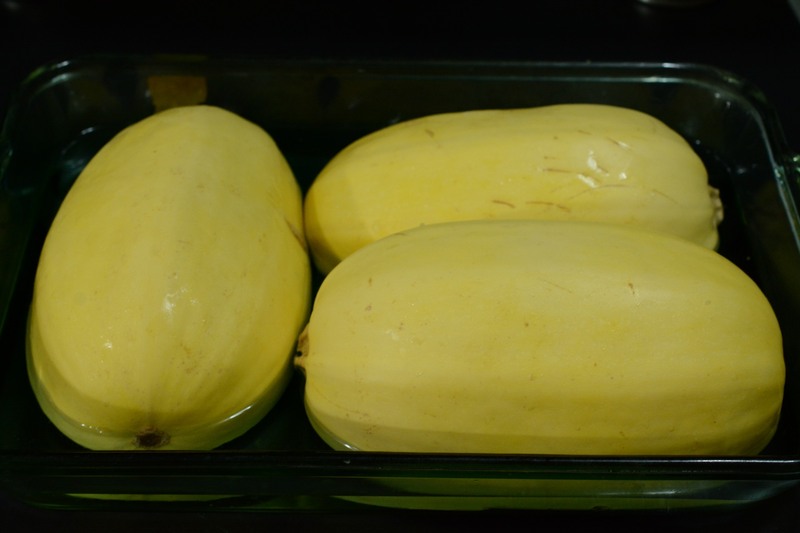 I weighed them before and after and it was 3064 grams of Spaghetti Squash raw which yielded 1707 grams of cooked spaghetti squash. So you can expect approximately a 50% yield. Well there you have it folks! 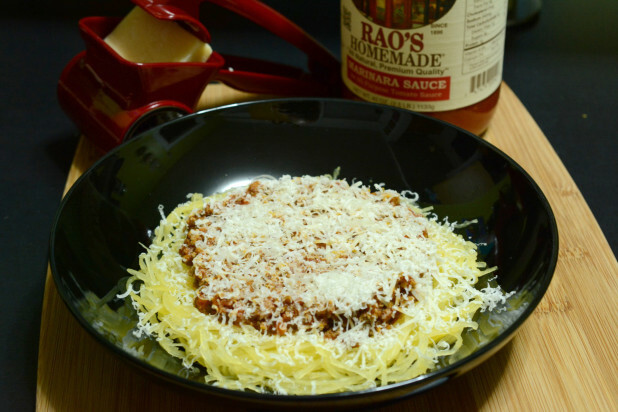 Lay a bed of Spaghetti Squash down, top it with the meat sauce, and cover it with some fresh grated Parmesan Cheese! Great recipe! And I am a spaghetti squash lover! I just started the Keto diet and am just not able to know how much veges is 30g. I almost picked up SQ this weekend to enjoy this week but then worried about its carb content and passed on it. 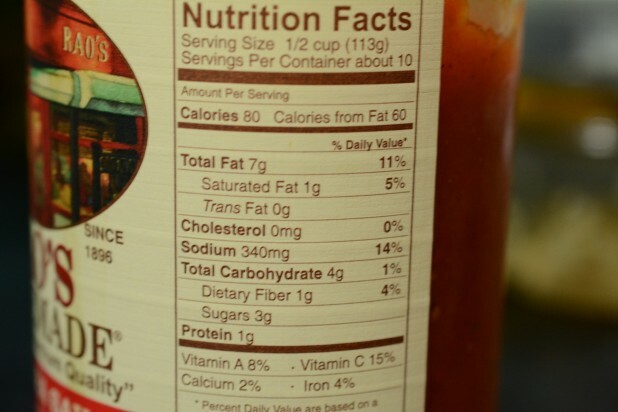 So are you saying that 1 med SQ has 6g carbs? Surely because of its fibre content. But good to know. Now I can enjoy my SQ. It’s been 3 days on the diet. I have massive headaches despite having lots of butter and mayo in my foods. I also use Himalayan salt thinking maybe I am not taking in enough salt. I was feeling really guilty today because I had 1 baby bok choy, 2 leaves of Napa cabbage and a cup of broccoli – all stir fried in one meal. I had all that because Dr. Diet said 30g = http://www.dietdoctor.com/thirty-grams-of-carbs-in-two-ways – but I am telling you I am feeling drowsy and bloated. Not good. Next time, I will reduce the carbs. Would you know or can you give me an idea of how many cups of vegetables = 30g carbs? Please and thanks. I usually eat spinach, broccoli, mushrooms, onions, tomatoes, peppers, fennel, endives, cauliflower and when I make chilli, I do use 1 can of Kidney beans. It’s not a chilli for me without kidney beans. 1 can of beans with the usual ingredients makes 6 servings. If you’re just starting, you might just be getting induction flu, which is common. Make sure you’re getting lots of potassium with spinach or, in a pinch, low-sodium pickles.